Don’t forget, you can get free salad from Fresh & Easy today. 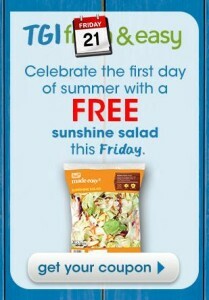 Free Made Easy Sunshine Salad (12 oz.). This one does not require any purchase! Be sure to print the coupon. Valid 6/21/13 only. Limit 1 per customer.